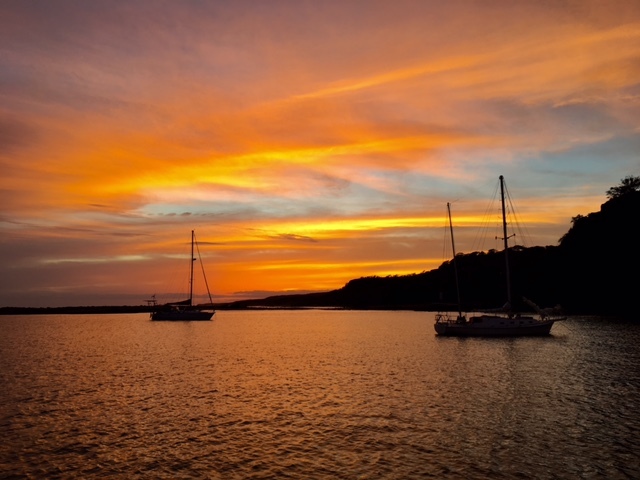 Wow it feels so great to be out at the ocean, in freedom, in nature, on the water and now at a calm and peaceful anchorage in the South East of Molokai. 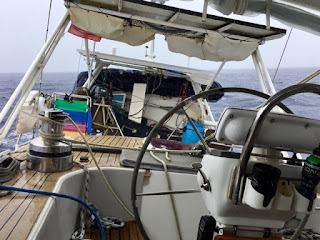 We left our anchorage Motua bay on Oahu's West End on friday morning at 2am since Marcus was not able to sleep that night. 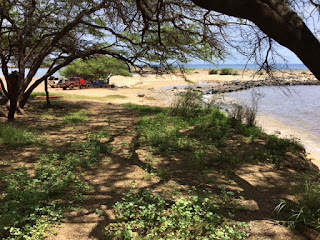 We loved getting out there, it was really calm in the protection of Oahu. So calm of course that we had to motor. There was not much wind expected anyways which is good for making the passage between Hawaian Islands. The channels are really bad and they warn you to sail through the channel in winds over 15kn because it will blow hard in the channel then. Anyways, we had leftover swell from two sides and were rocking and rolling, but not too bad. It just kept raining and raining- and hoping for wind. Then all of a sudden, Marcus was asleep and I was looking out the window watching the birds and felt a breeze on the nose. I set the sails and off we went to a beautiful 2hr sailing. After a wind shift we sailed at 60 -90 deg with 8-9kn which felt the smoothest ever. At 2.30pm we dropped anchor in Lono harbo. This old harbour where we are now is a superb protection from the swells. We love this peaceful place. Other than a family living in a tent, an old guy or lady (haven't found out yet) living on a very old trashy sailing boat at anchor and some locals coming to the beach for fishing on sundays it's uninhibited. And no cel phone reception except if you walk up the hill. I hear and sea birds and dragonflies flying and the waves rolling in. I love my nature. We'll be here another day or two and then head over to Lahaina on Maui again. Our friends that we met in Penrhyn and who stayed in Kona (Big Island) came down her a day after us and leave for Oahu tomorrow morning. Great to catch up!